Detail from a 6th century mosaic in the Basilica of San Vitale, Ravenna, Italy. You can clearly see the 8-pointed star symbol in the center of the altar cloth. 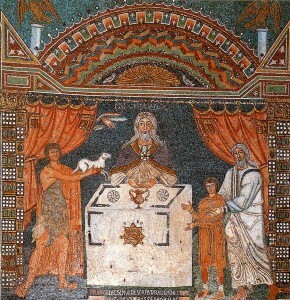 This mosaic depicts Melchizedek in a purple cloak administering bread and wine on the altar as the high priest in the temple. God’s authorization of the event is manifest by His hand reaching down through the clouds. On the left Abel offers a lamb to be sacrificed, and on the right Abraham offers Isaac, both shadows of the ultimate sacrifice of Jesus Christ1. 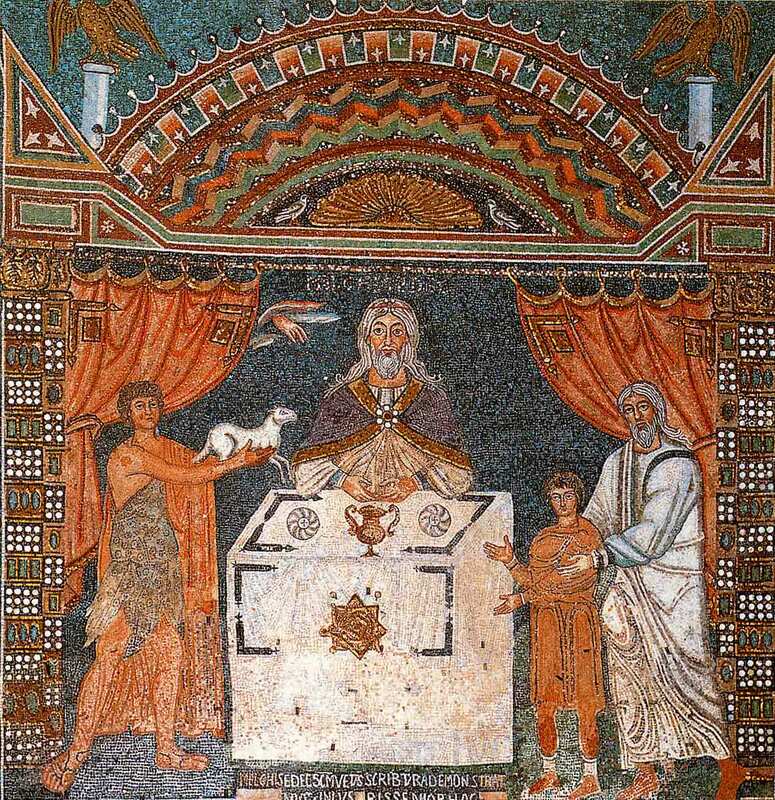 It is also interesting to note, as Nibley did, that there are gammadia symbols (shaped like the Greek letter gamma) both on the altar cloth and two veils in this scene. The mosaic dates from the 6th century. Click the image to the right for a larger view. There is much detail work inside the star symbol that is hard to discern. It appears as though there are two interlocking squares with two or three more concentric circles inside of them. I would be interested to find a more detailed closeup photo of this mosaic if anyone can find one. SuperStock has some high resolution versions available here; unfortunately since they are rights-managed stock photos the cheapest I could figure to purchase it would be $150. 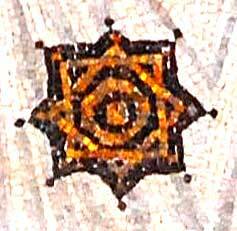 There is also another iteration of this symbol on an altar cloth in a different mosaic in Ravenna, Italy. It is located in the Basilica of San Vitale. I was able to find a very high-res photograph of this mosaic. Click the image on the right to see the larger version. 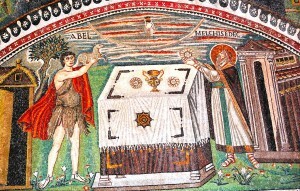 In this scene, again we see Abel offering his lamb, and Melchizedek offering the bread on the altar. Behind Abel is an Adamic-type sanctuary, and behind Melchizedek is the temple of Jerusalem. The hand of God again is seen coming down through the clouds to accept the offering2. You can see the 8-pointed star symbol, but it is also very evident that there are two interlocking squares that make up the symbol, with two concentric circles inside of them (see the closeup at the beginning of this post). After conversing with some LDS scholars at BYU and elsewhere, these are the only two concrete artifacts which we’ve been able to find which might link Melchizedek with the symbol of the 8-pointed, two interlocking square, star. Moreover, so far we have been unable to find any non-LDS scholars who have referred to this symbol as the “seal of Melchizedek” (although Michael Lyon believes he may have once seen it referenced by that name in a Catholic commentary on symbols). However, there is other supporting evidence for a possible link between Melchizedek and the symbol, as I will share in the forthcoming posts, including my phone conversation with the design architect of the San Diego Temple. Good detective work. I have read Temple and Cosmos a number of times and was aware of the seal of Melchizedek, and have visited the SD Temple a few times, but I never put it together. Somewhere (the open house?) we picked up something about the architect for the San Diego Temple being a Catholic, which explained why the temple is so uniquely designed, since he wasn’t restricted to previous temple designs. Is there anything to this story, or is it another Mormon myth? The Hyndman’s were Roman Catholic and “had not toured the interior of a Latter-day Saint temple until the Las Vegas Nevada Temple open house commenced in 1989” (LDSChurchTemples.com). William S. Lewis Jr. was primarily responsible for the design of the temple, and of this symbol, being the design architect on the project, but I’m sure he worked closely with the Hyndman’s as well. Br. Lewis is a member of the Church and is currently a sealer in the San Diego Temple. I had a phone conversation with him a few days ago, and will relate the story he told me in the next part of this series. Not sure if you noticed this but the mosaic from St. Vitale with the Seal of Melchesidec is also on the cover of Margaret Barker’s book Temple Theology. 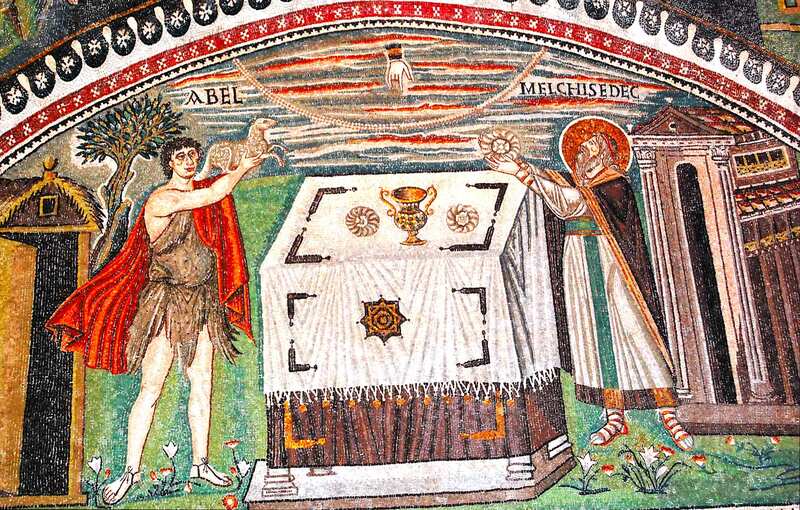 On about Scenes from Abraham’s life: Abel and Melchizedek bringing their offerings to the altar: Who created the picture?